Ok all of you fall lovers. Yes, I mean YOU–with your Bath and Body Works candles burning and your brain thinking of greens, browns, mustard yellow and gray. Fall does not officially start until September 23rd, ok. Let’s all try to savor summer just a little bit longer–after all, I didn’t talk to one person last winter who was not complaining about the 3 months of polar vortex we had. And you all realize what season comes after fall?? Just checking. 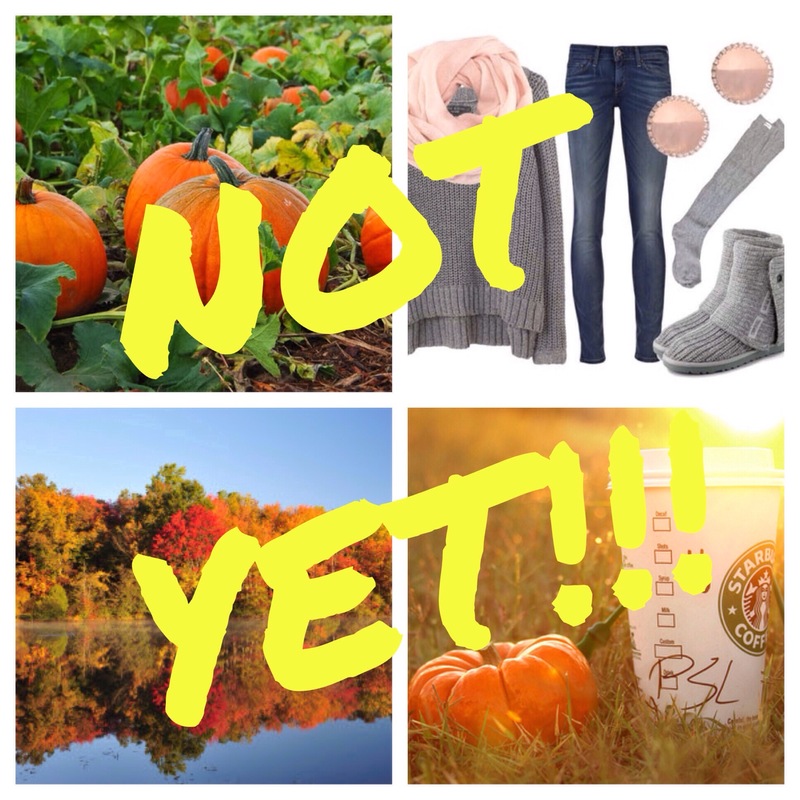 Every year, during this “limbo” time–after August 1st to September 20th, all I ever hear is “I can’t wait to get my boots out, ohhhh and sweaters, ohhhh and the pumpkin spice latte is coming back early!” Just wait, Starbucks will bring it back earlier every year. And, I’m pretty sure it will be on the menu year round before long and lose the lustre that comes with it. Remember the cinnamon dolce latte? It was only a winter special for a few years before it became a permanent member of the year long menu. Now I don’t want one because I can get one anytime I want. You see? Only in America would someone have that type of thinking. We all do it though, seriously! I love fall in Indiana just as much as anyone, but I realize it’s the beginning of the end of the year, when things will soon be cold, dark and dreary. Schools rush summer and start the first week of August now, but even so, I’m hanging on. Maybe it’s just me, but it seems like summer takes forever to get here, and when it finally does show up, it’s gone again in a month. I feel like I try to pack so much into our summers and we don’t even get to accomplish half of it. For example, I still haven’t been able to take the boys to our neighborhood pool and we didn’t make it to the county fair this year either. We did get to take an amazing beach vacation though, and had two wonderful birthday parties for our little guys, we started T-ball and now we have started soccer, Brayden rode his first ferris wheel and I had my first “fair style” corn-dog from a festival we were at (and it was heaven – big ups to deep-fried batter). Brock built the beginnings of our deck and I have tried to get to the park to walk or take evening neighborhood strolls (accompanied by Mason of course) as much as I can. I’ve hit up the local farmers market for dinners and also my parents garden as well. I’ve enjoyed my fair share of ice cream this summer and seen several summer movies. I’ve driven with the windows down jamming to Miranda Lambert on countless back roads and enjoyed coffee on my parents deck in the sunshine. Summer is my favorite and I’m not letting it go until that 4th week of September. Step off fall, it’s not your turn yet!